OK, so you are coding your shiny new AngularJS Web App and you now require functionality which, let’s say, involves uploading a file. You’ve coded this before you whisper to yourself, but it was in PHP using a jQuery plugin, which was called… errm file upload or something. Then the lightning hit you and thought “there must be an “AngularJS Plugin” which I can use that has all the hard work done for me! ?” So you do a quick Google and find a decent AngularJS Module suitably called Angular File Upload. So now, you get right to it – follow all the setup steps provided and even copied some nice example code. Boom. It doesn’t work. Why you wonder? Eventually, you realise that decision to use Angular 1.4 say could the problem? How could you be so stupid you thought. You check through the Module’s Readme for which versions of Angular it supports. Nothing about it in there. So now you scan the files and find “angular”: “~1.2.11″ in the bower.json dependencies! (which translates to approximately version 1.2.11 using the semver syntax). Still you are left wondering which version of AngularJS Core exactly should you be using. Has anyone else been here? Whats the solution? 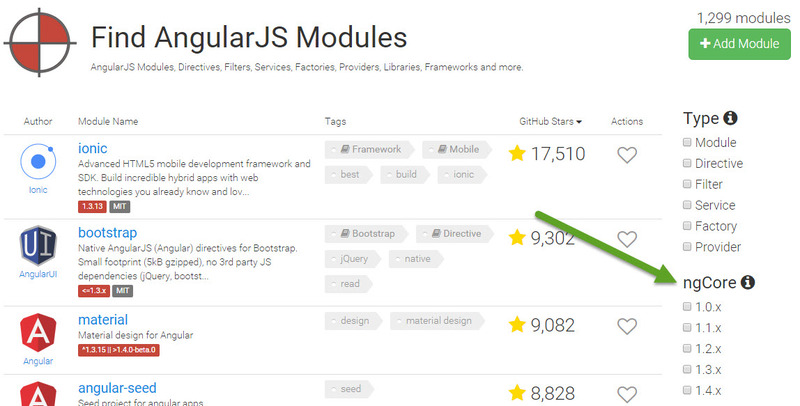 How do we make it easier for developers to use AngularJS Modules? Furthermore, how can we check the quality of a module before we start using it? Check out ngmodules.com and use their ng supported versions search filter!